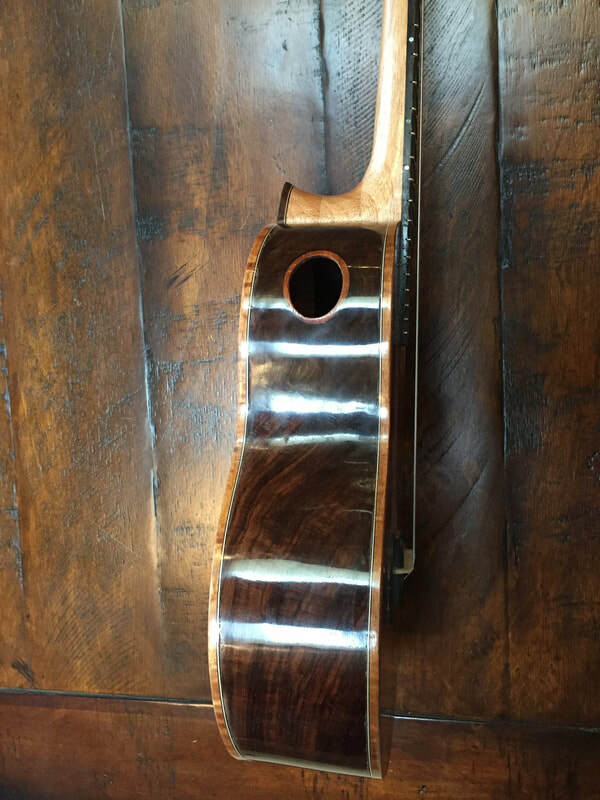 ALWAYS A DELIGHT TO SELL TO A "PLAYER"
This is a beautiful Kasha tenor with truly exceptional East Indian Rosewood back and sides and NYC watertnk Redwood sound board. I will be taking it to the Vancouver B.C. 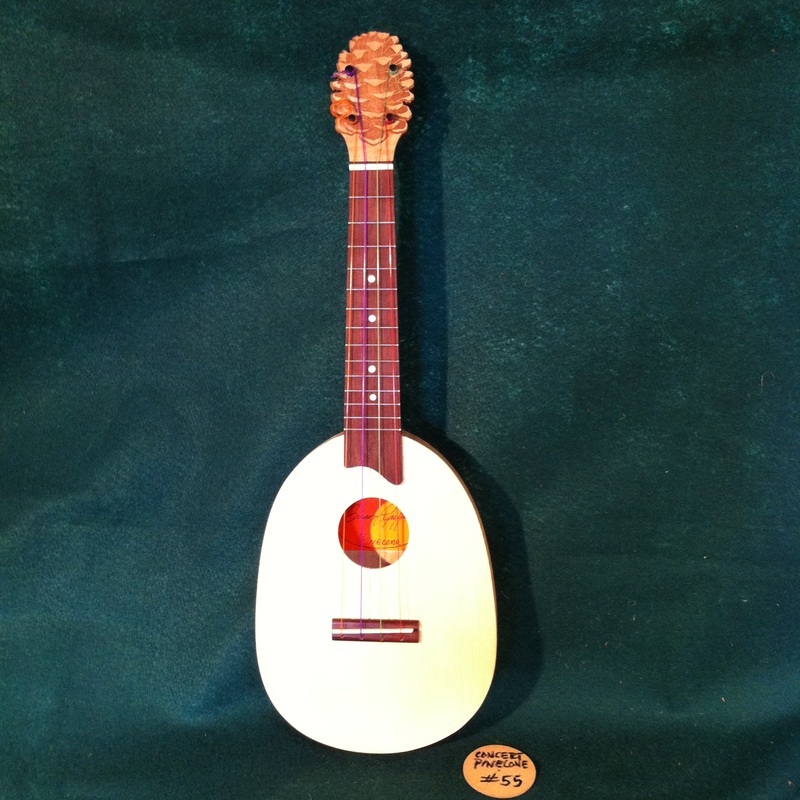 Ukulele Festival March 21. If you are attending, say hello and try it out. I kind of hate to sell this one. I have been playing it a great deal. Wonderful tone and clarity. Extremely playable neck and radiused fretboard. 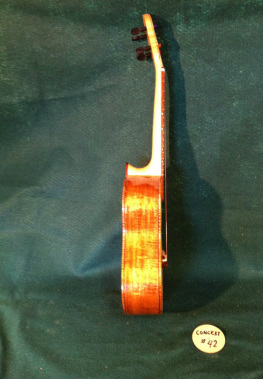 I have strung it with Thomasik-Infeld basses and South Coast trebles. I am very pleased with the results. This is a good one. 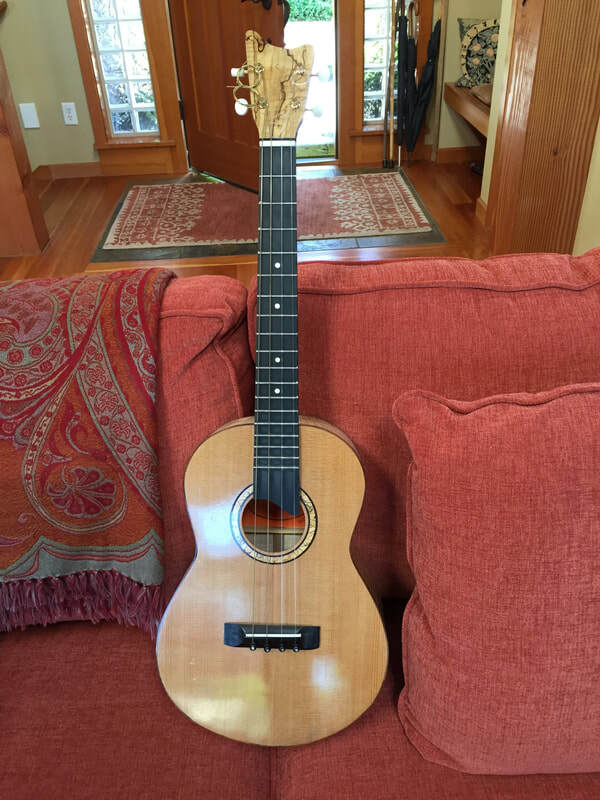 I DON'T NEED TWO BARITONES SO I AM SELLING THIS EXCELLENT MAPLE AND SPRUCE INSTRUMENT. 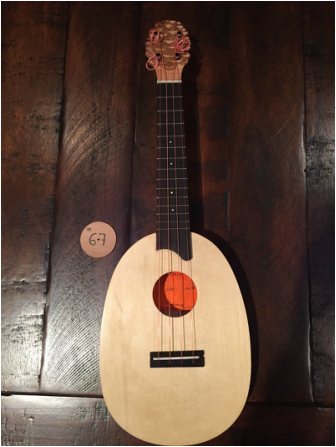 This excellent tenor is made available because its owner is lusting after Number 103 the Kasha tenor and does not think he should keep both. If 82 is sold he will buy 103. SOLD TODAY, SEPT. 13TH, KIND OF SORRY TO SEE IT GO. 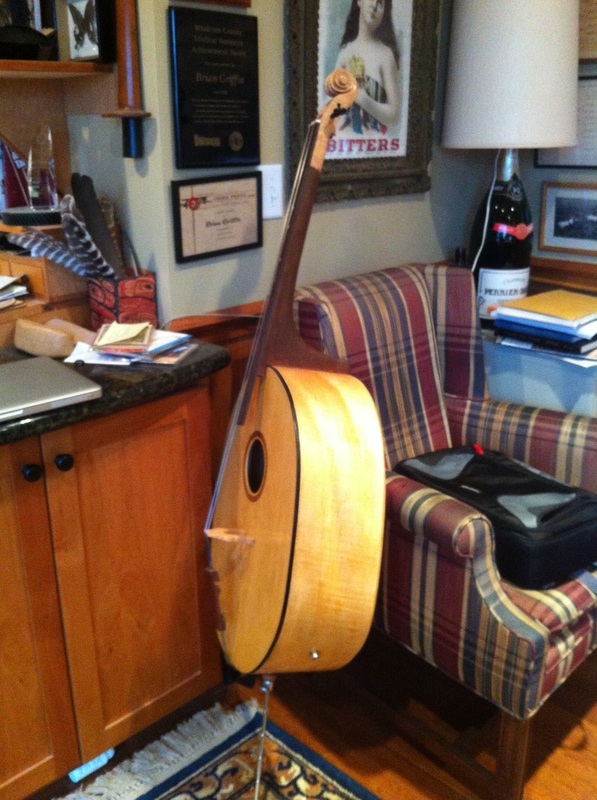 This fine tenor used to be my personal favorite until I built my first Kasha. 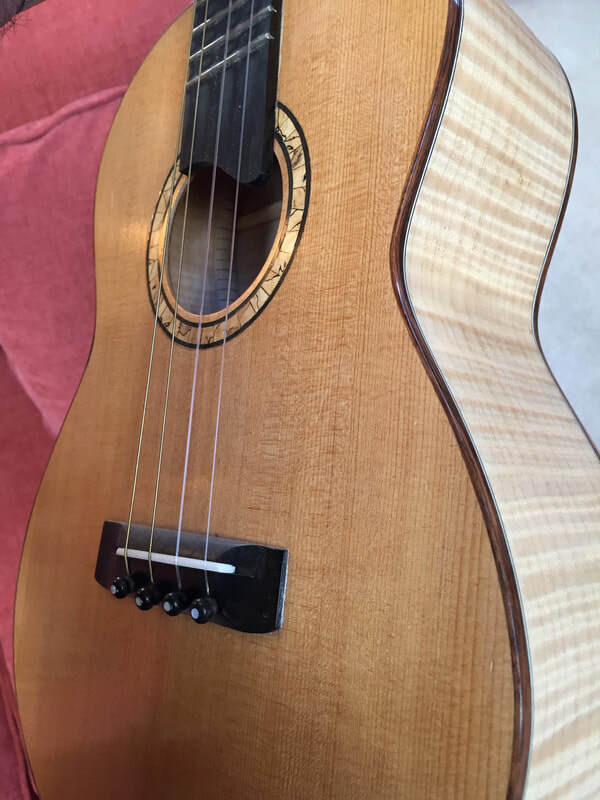 It shows a tiny bit of wear, but is still a lovely instrument complete with a MiSi pickup. I kind of hate to sell it, but if it isn't getting played it needs to go. 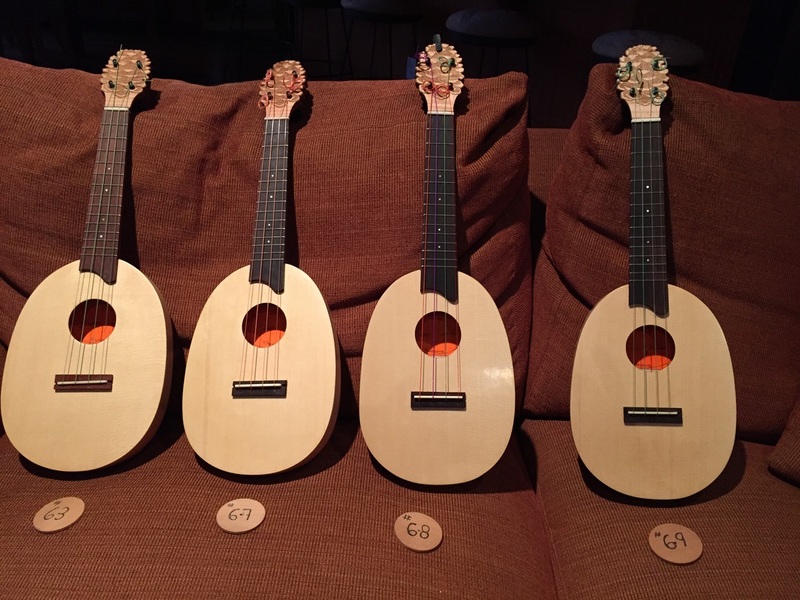 How many ukes does a guy need? Peghed 4/1 gear ratio tuners. 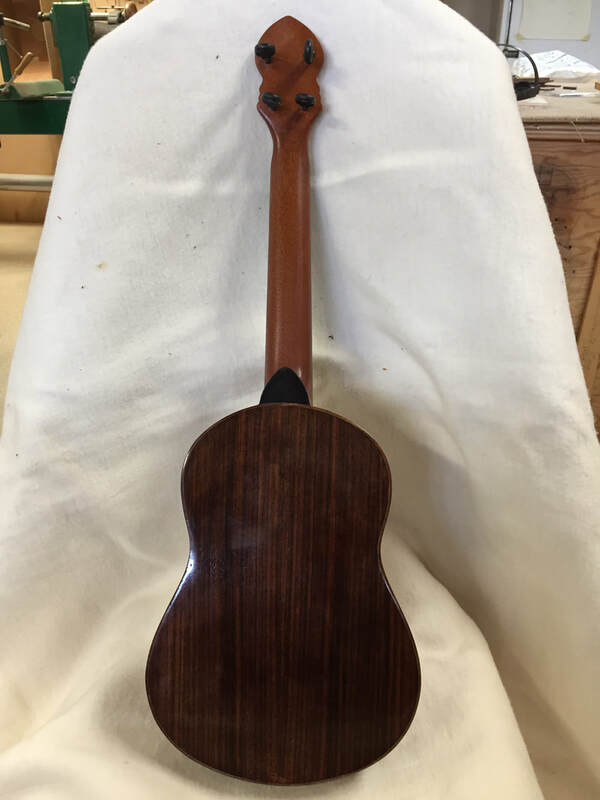 another in a line of marvelous sounding tenors made with East Indian Rosewood backs and sides and "water tank Redwood" soundboards. This Redwood is special. It comes from an old water tank from atop a New York City building. This is not "sinker Redwood" but it has been absorbing the minerals from NYC water for perhaps eighty years. It makes rich, warm sounding instruments with great volume and sustain. Water Tank Redwood has become my favorite soundboard material. 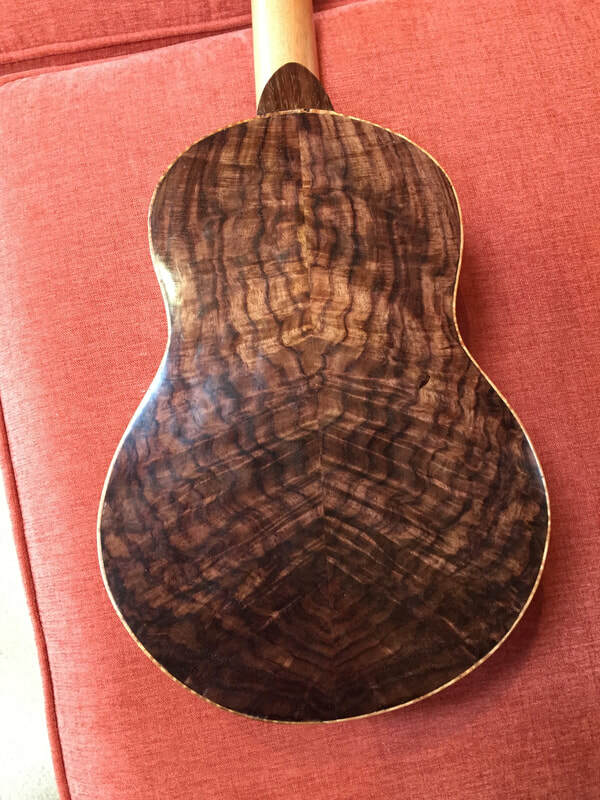 East Indian Rosewood back and sides. 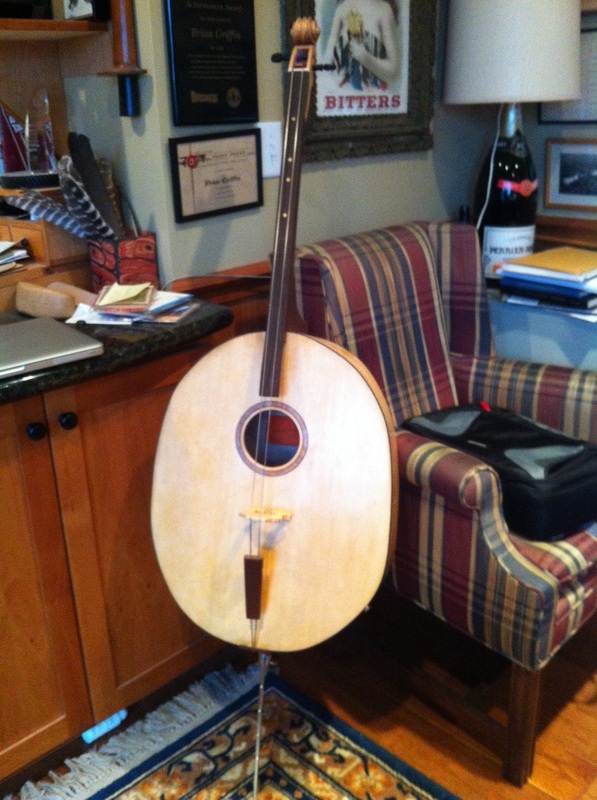 This is the 103rd instrument that I have built, and one of the very best. 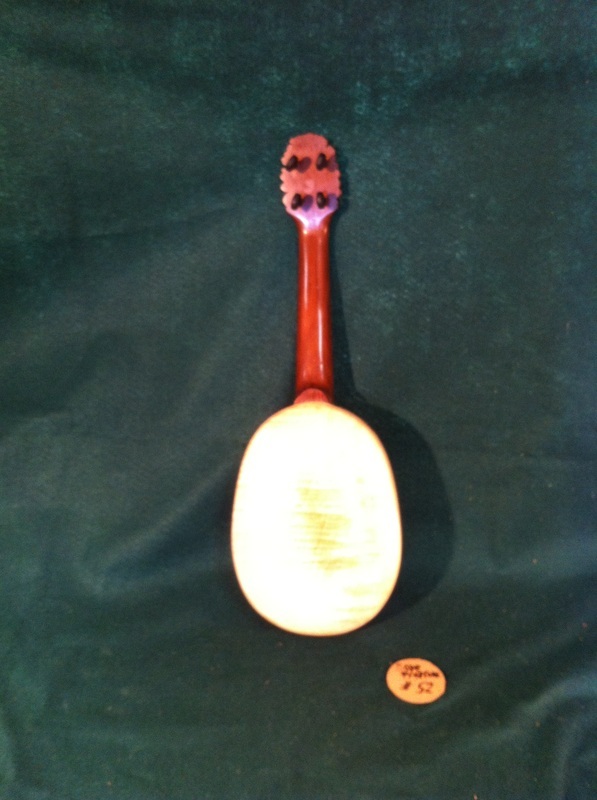 It is a Kasha Tenor with remarkable tone and clarity. 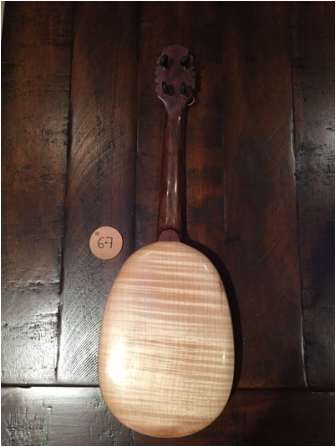 Part of it's clarity of sound comes from the fine grained Port Orford Cedar soundboard. 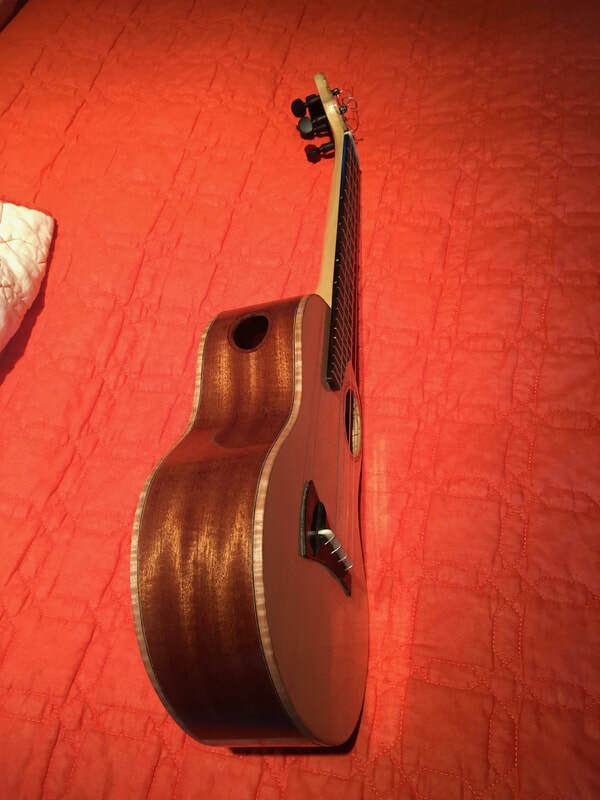 Part of it's quality of sound must be attributed to the Kasha bracing system which I am now convinced its the future of quality ukuleles. I WILL TAKE PICTURES TOMORROW AND POST THE INDIVIDUAL DATA FOR YOU. TWO OF THEM ARE TRADITIONAL FAN BRACED TENORS, BUT ONE IS A SIMPLY AMAZING KASHA BRACED TENOR. I have now made three Kasha braced tenors and just completing a Kasha baritone I am convinced that this unique bracing system makes an instrument superior to traditional bracing. 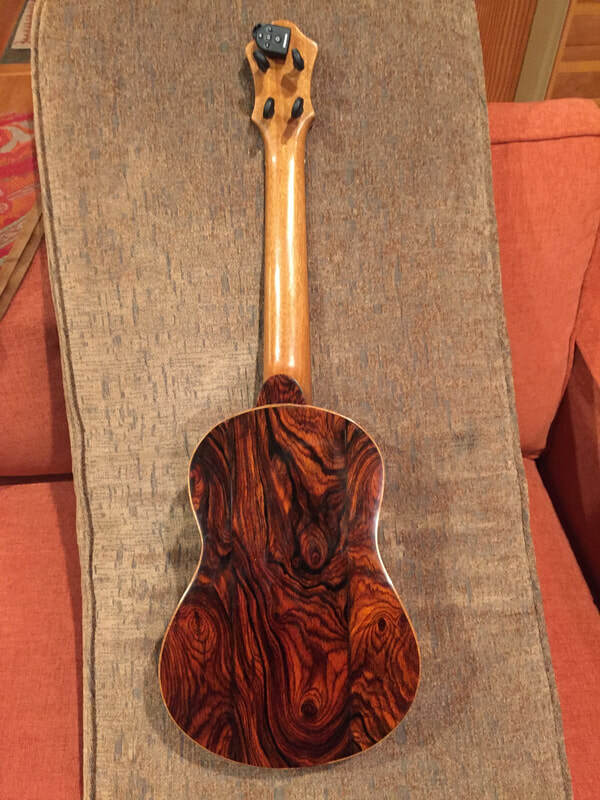 I am so in love with my first one, an East Indian Rosewood body with a Redwood soundboard that I will not sell it. 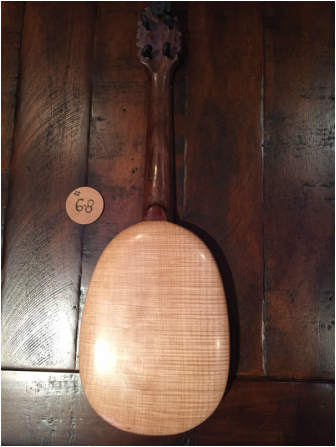 I just sold the magnificent Cocobolo and Torrified Spruce #102, and it's build-mate #103 is still available. I will post it tomorrow after photographing it. # 67 is sold and these beauties are all gone. #63 was mailed today to its new home in Indiana. 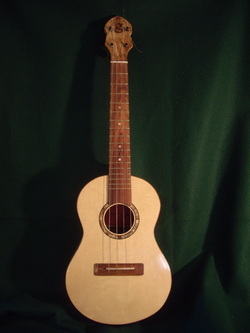 This uke has wonderful tone, Bonnie will be happy. SOLD #67 was mailed off today to its new home in Tennessee. 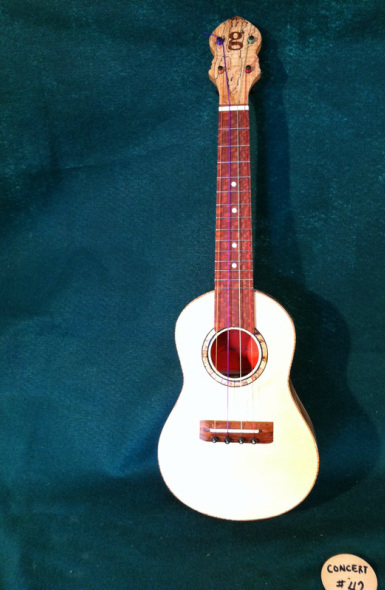 $550 This brilliant sounding uke has a cosmetic flaw and I am reducing the price as a second. 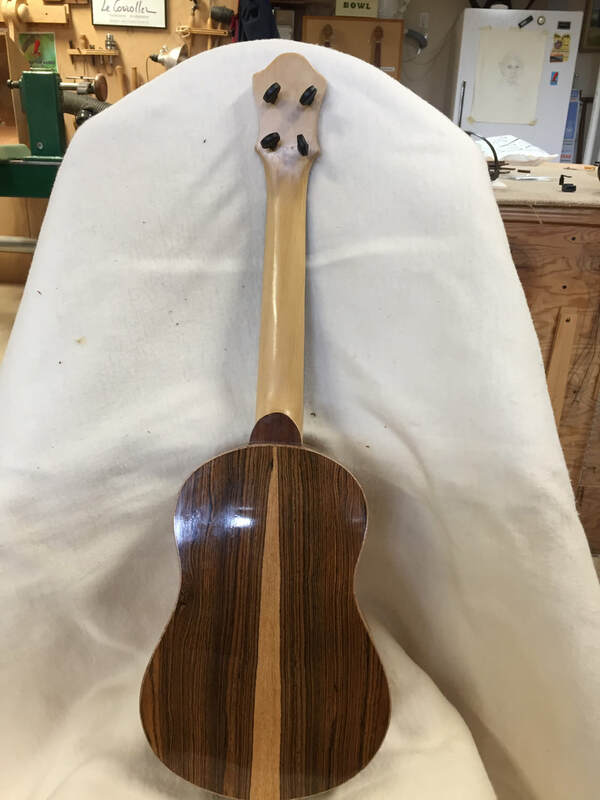 Englemann Spruce top, walnut neck, maple sides and back, maple peg head plate with incised pinecone image, Peghed tuners, Honduran Rosewood fretboard and bridge, buffalo bone nut and saddle. green Aurora strings. 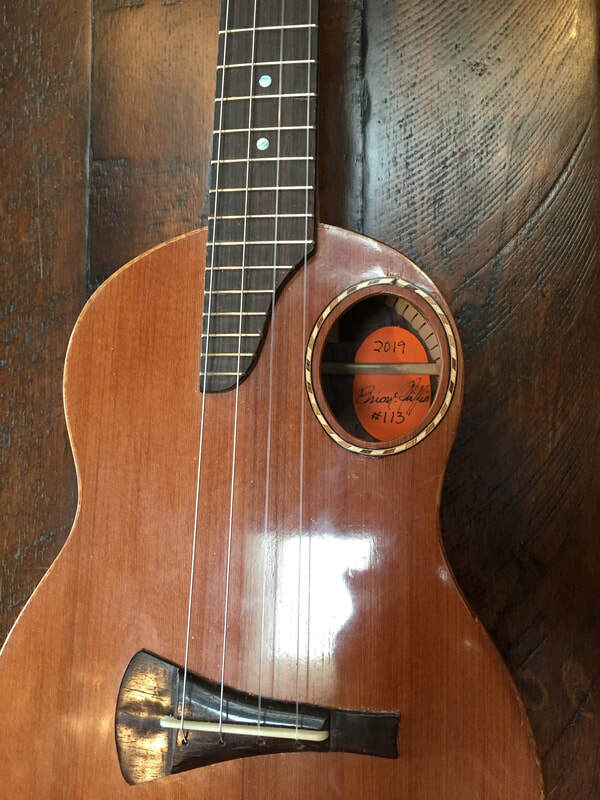 If you look closely you can see a dark line above the sound hole alongside the G string. there is also a tiny filled tack hole that shows near the fretboard between the G & the C string. The sides and back are lovely tiger stripe maple, Big leaf maple from the forests of Washington State. 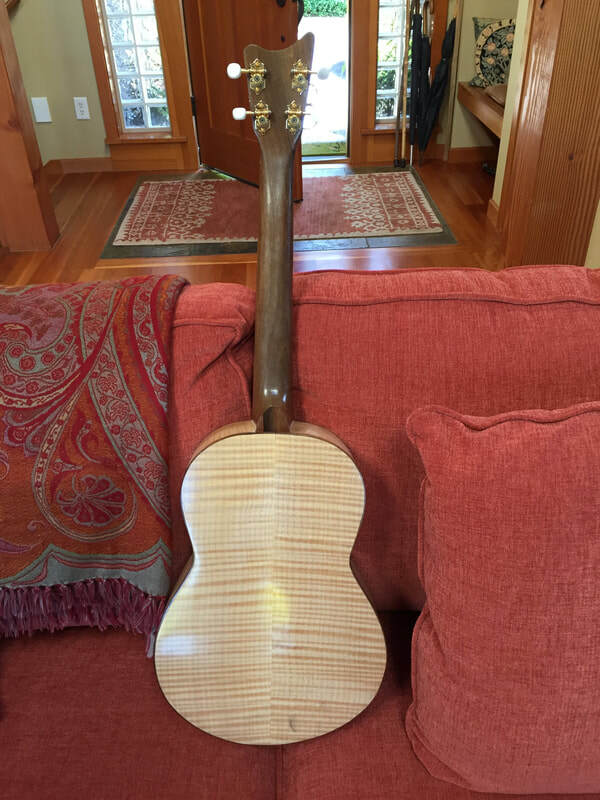 The Walnut neck is from a tree that grew here in Bellingham and that I have had drying for 35 years. The tuners are Pegheds. 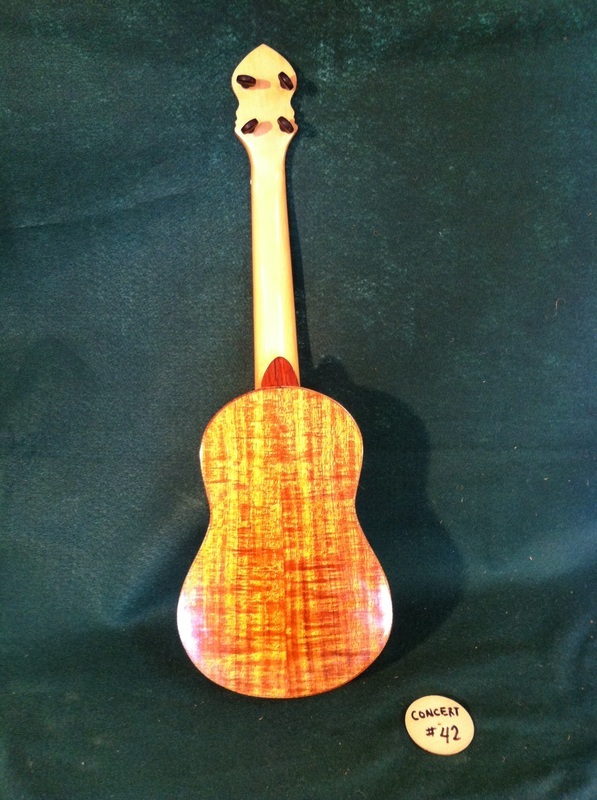 The end cap at the neck body joint is Honduran Rosewood outlined with a maple strip. Great tone and low action. 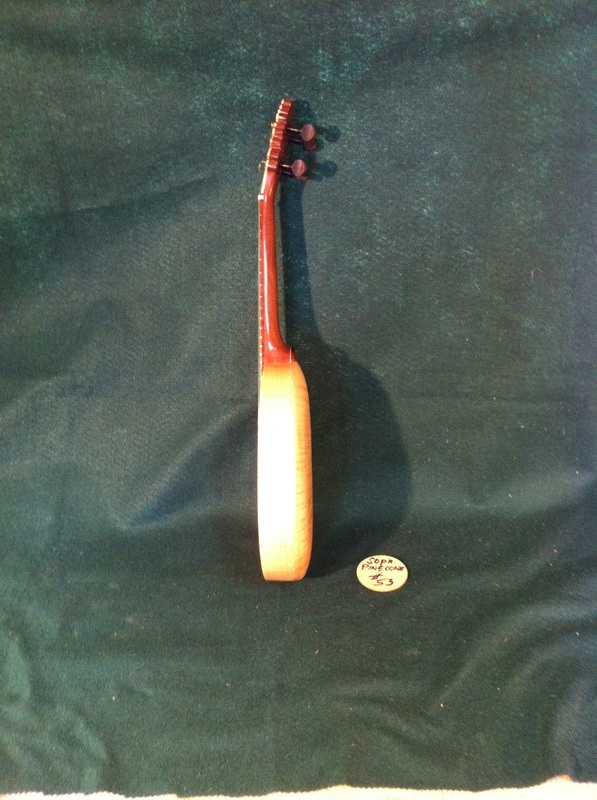 #68 $600- A perfect Engelmann Spruce top set off by the East Indian Rosewood fret board and bridge. 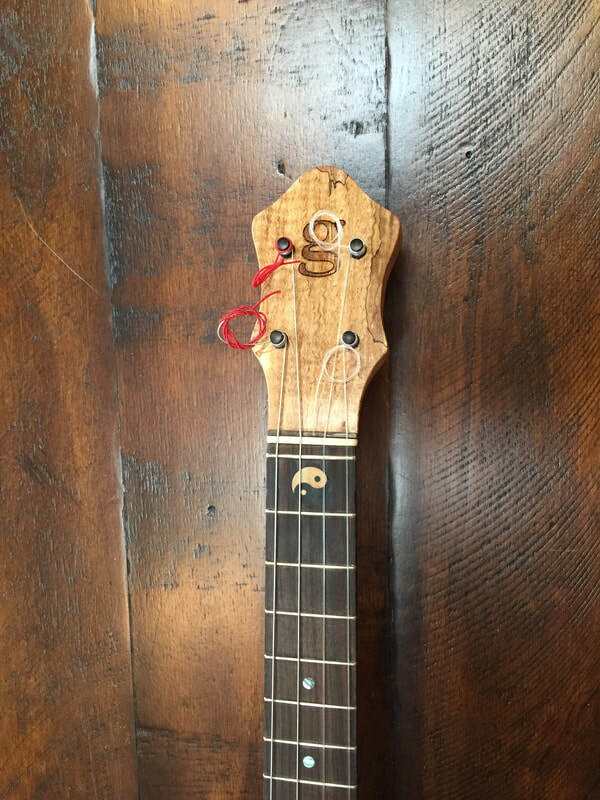 The unbleached buffalo nut and saddle accompany the small mother of pearl marker dots on top and tiny white dots in the side of the fretboard. 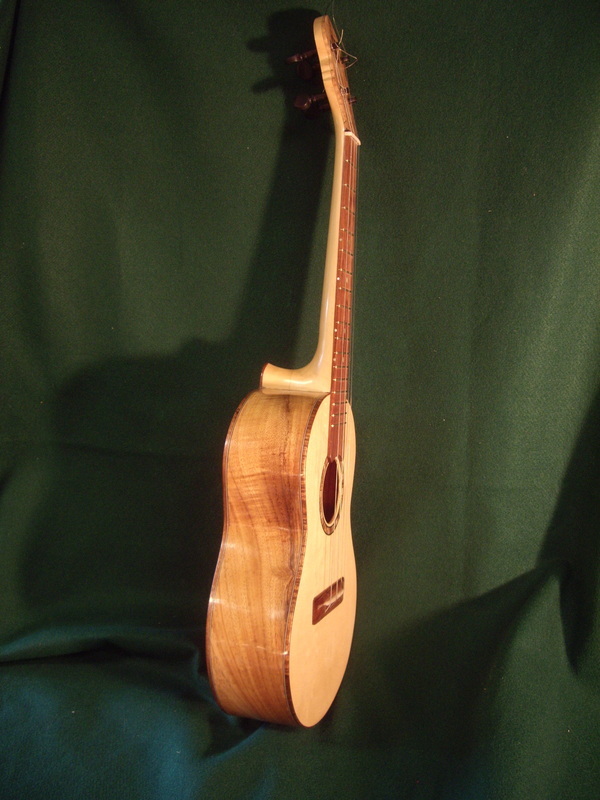 This one is strung with Aurora/Aquila multi-color strings and a low G. Happy to change it to re-entrant if you wish. 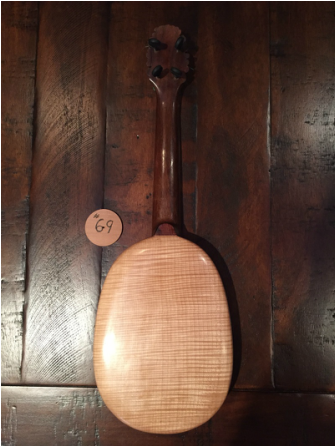 If you like tight tight tiger stripe this is the uke for you. 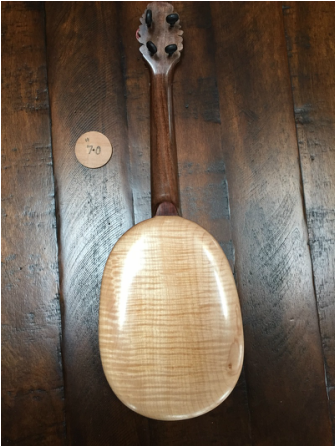 As pretty a piece of maple as I have seen, finished of course with many coats of French Polish for a rich glow. 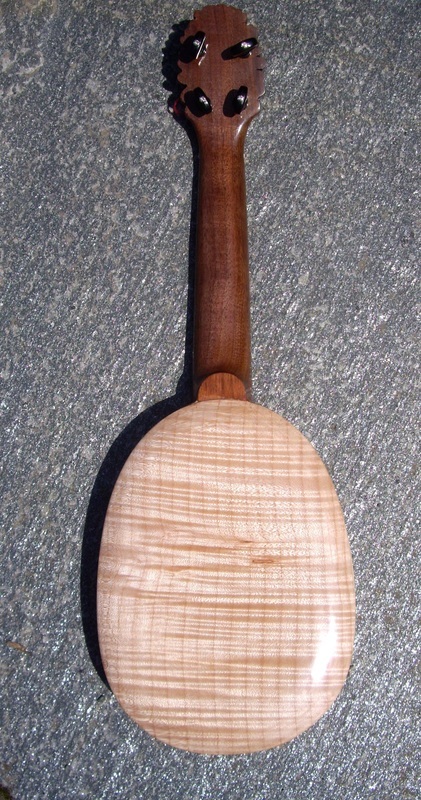 The heel cap is honduran rosewood set off the walnut with a strip of maple veneer. 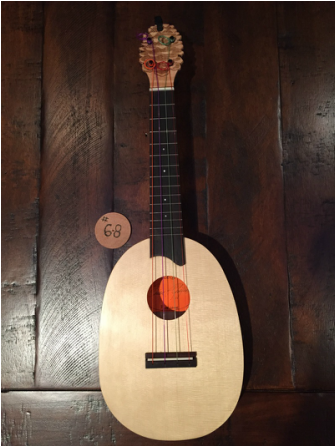 #69- $600- Flawless Englemann Spruce top, East Indian Rosewood fret board with small mother of pearl dots on top, tiny white marks on side. 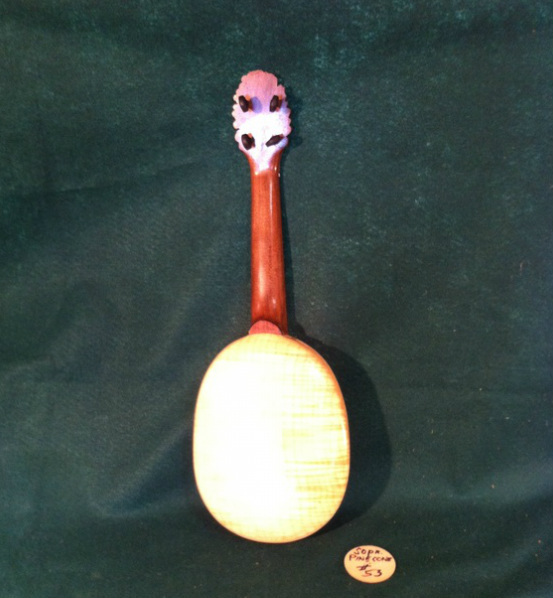 Buffalo nut and saddle, Pinecone image laser incised into maple at peg head, Peghed tuners. 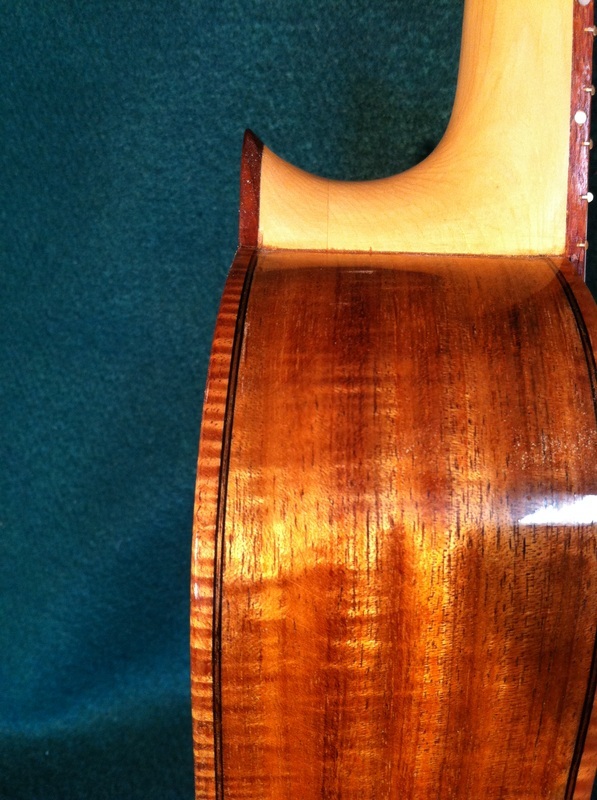 This back is truly exceptional as is the tiger stripe on the sides. One of the prettiest Pinecones I have made. 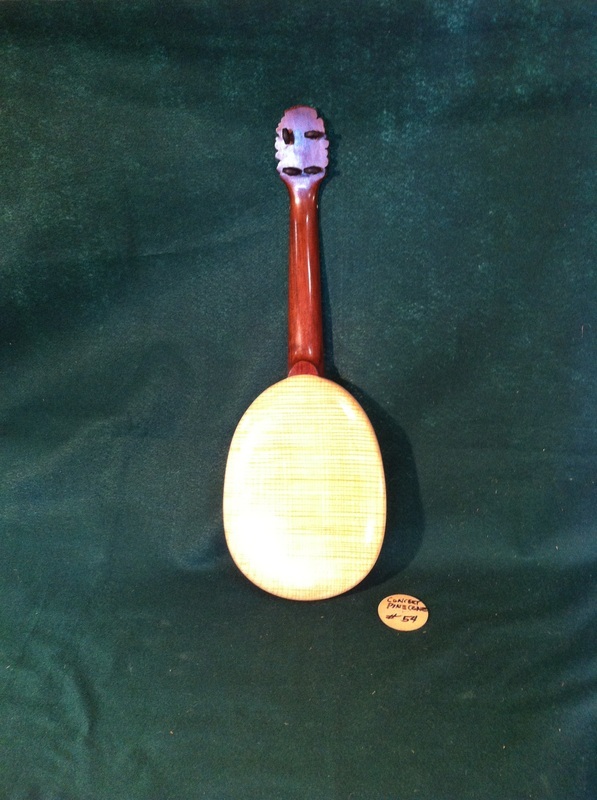 The neck is American black Walnut, Honduran Rosewood heel cap with a thin maple separating stripe. 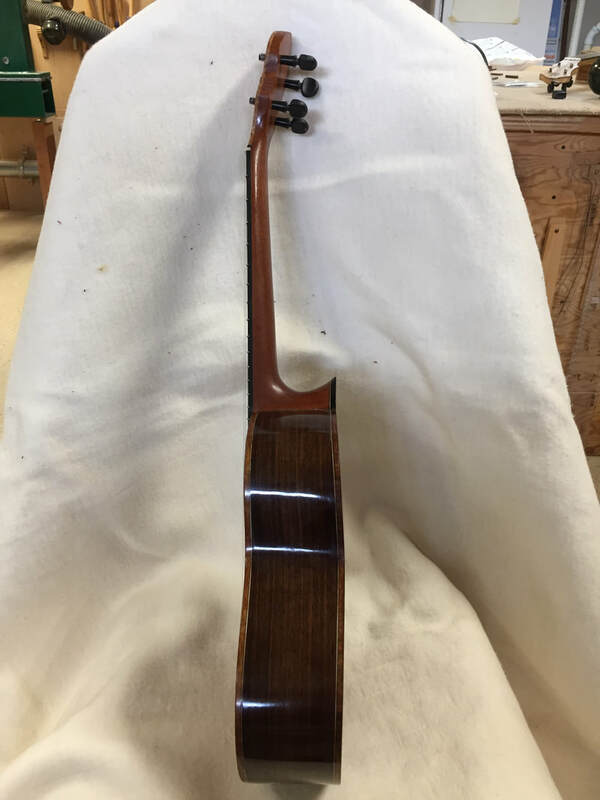 $600; Number 70 is now complete with its Peghed tuners. This is a handsome Pinecone with a really spectacular back. 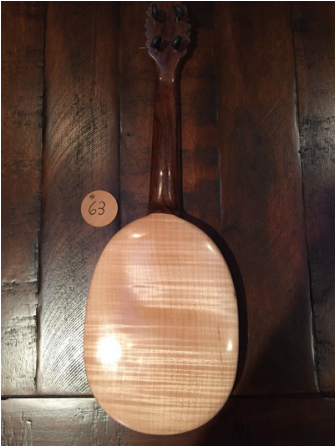 The big leaf maple does amazing things and when it is carved concave provides exceptional volume and tone. 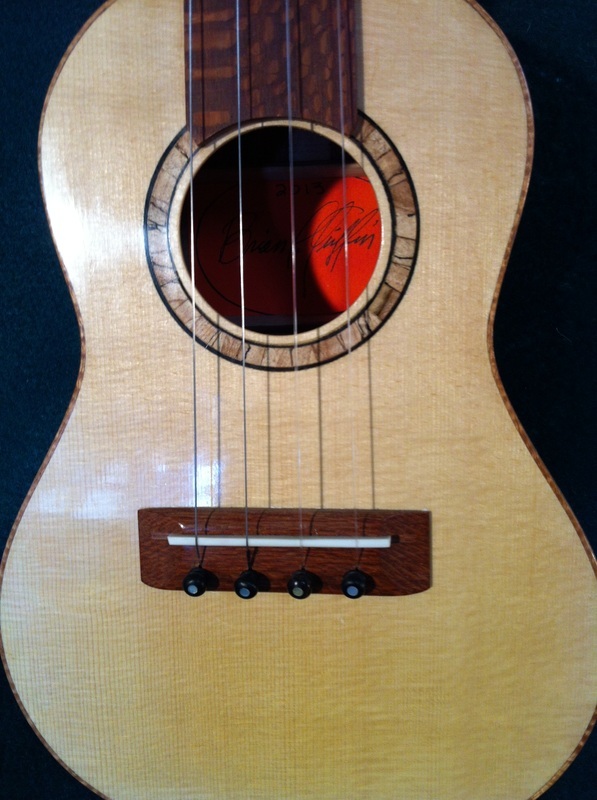 East Indian Rosewood fretboard on a walnut neck accents the lovely almost yellow look of the Engelmann Spruce top. 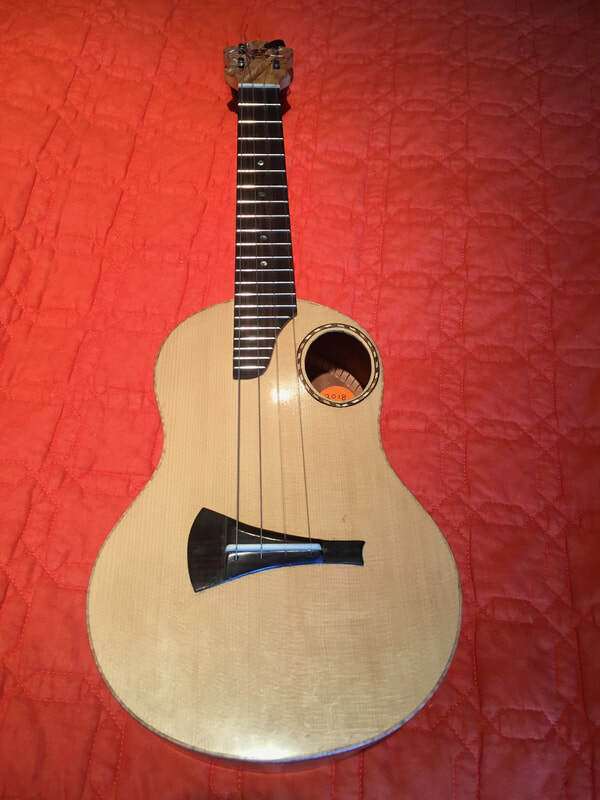 These great ukuleles come equipped with Aurora/Aquila colored strings and they sound great with a low g string if you prefer. A low G can be fitted for another $3.00. 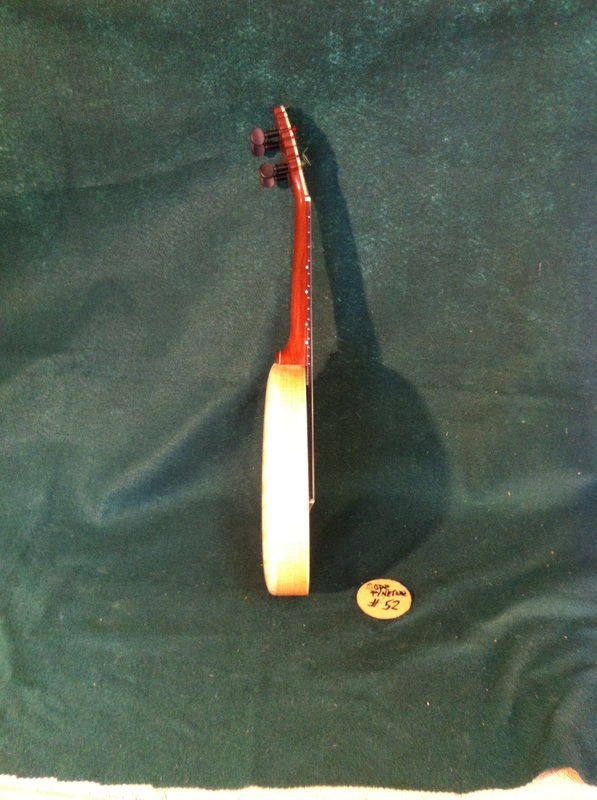 Then you will have an extra re-entrant G string for a spare. 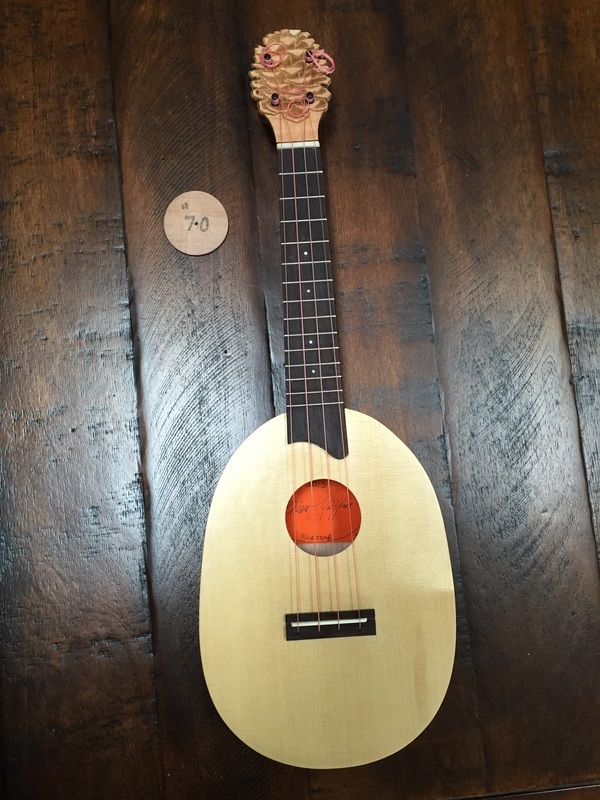 I BUILT THIS LAST SUMMER AND HAD GREAT JOY IN PLAYING IT TO ACCOMPANY UKULELE PLAYERS AT OUR LOCAL UKE JAMS. LIKED IT SO WELL THAT I HAVE JUST COMPLETED ANOTHER A LITTLE LARGER AND A LITTLE FANCIER. I DON'T NEED TWO SO I SHALL SELL THE PROTOTYPE. PRICE. $600.00 PLUS SHIPPING. THIS WILL BE A BRUTE TO SHIP SO HOPEFULLY YOU CAN COME AND GET IT. 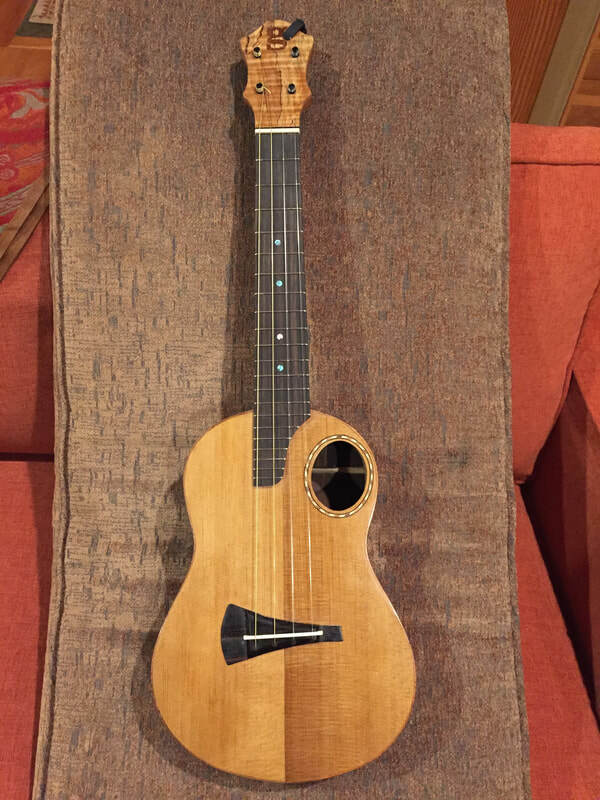 This lovely uke is patterned after my tenors that I call Blondes. 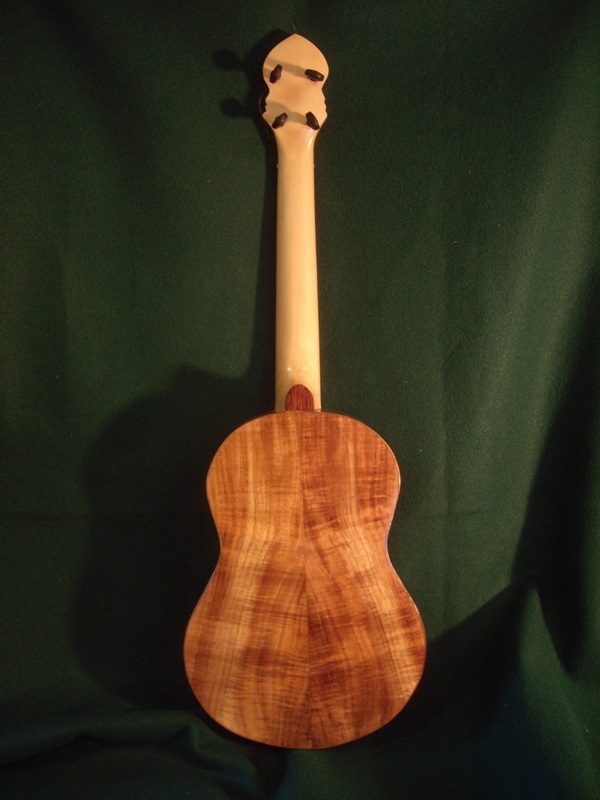 I really like the contrasts of the Alaska Cedar and the almost identical color Englemann Spruce, with the darker backs sides and fretboard. 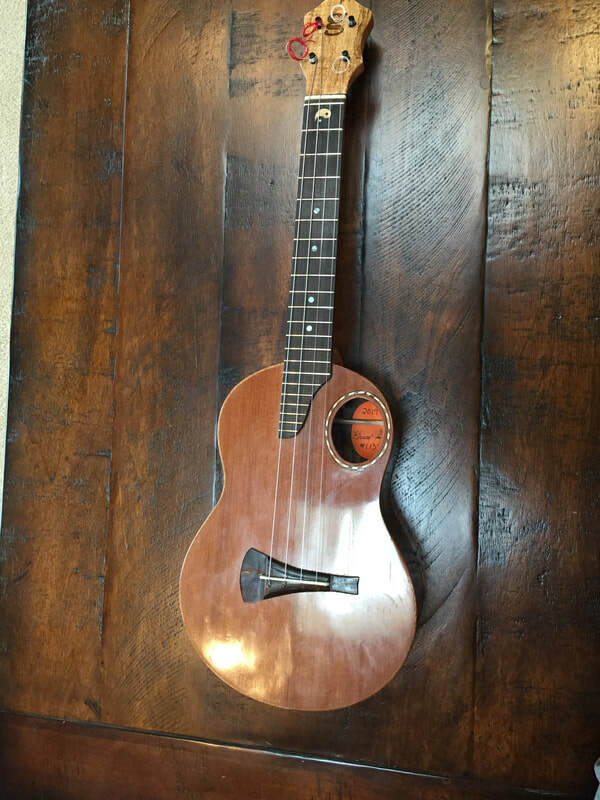 Englemann produces a warm clear tone and this uke is very playable. The rich fretboard and highly figured binding accents the Australian Blackwood nicely. I will add a turned rosewood strap button without cost if the buyer desires one. SOLD ONE TODAYp SORRY, THE OTHER IS NOT AVAILABLE. 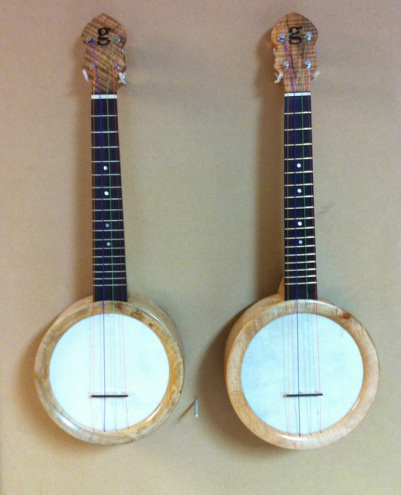 I WANT TO HAVE ONE OF THESE FUN TENOR BANJO UKES TO PLAY FOR MYSELF. I MAY GET IN THE MOOD TO MAKE SOME MORE IN A FEW MONTHS SO KEEP WATCHING. The soprano #53 sold today. Nov. 24, 14. Gonna have to make some I guess. 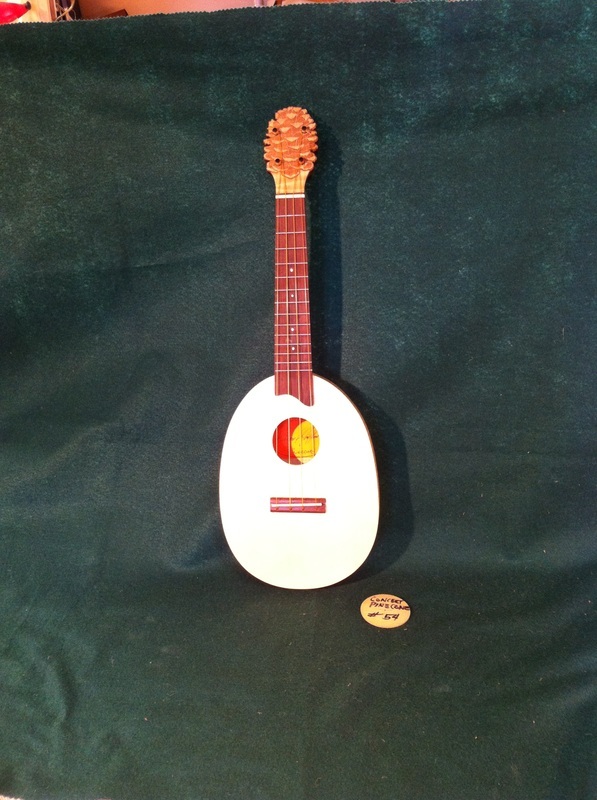 These great little travel ukes have a wonderful rich bright tone. You will want to used it as an everyday player. 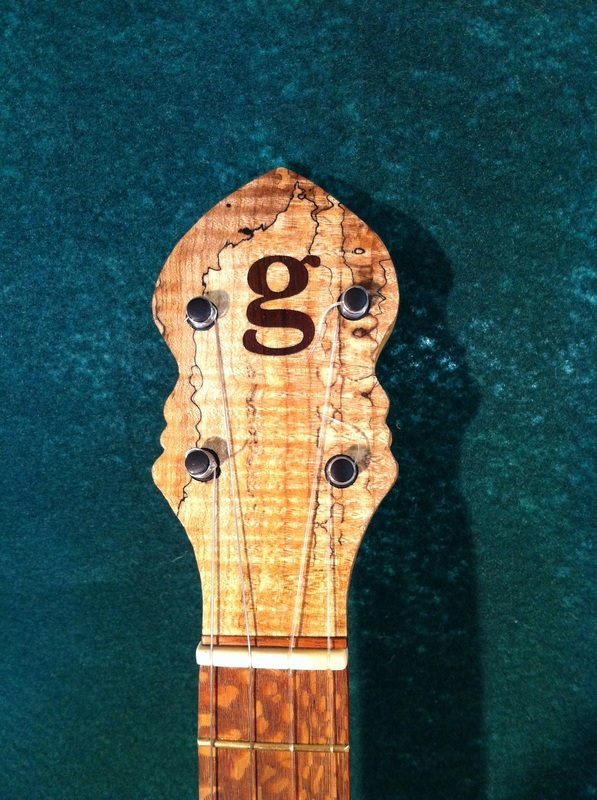 Spalted maple peghead plate with g logo. This is a beautiful instrument. It weighs only 1lb, 2 os. Plays beautifully. I call it "The Blonde" More photos are available upon request. Also sound sample can be emailed to serious buyers. I hate to part with this beauty. 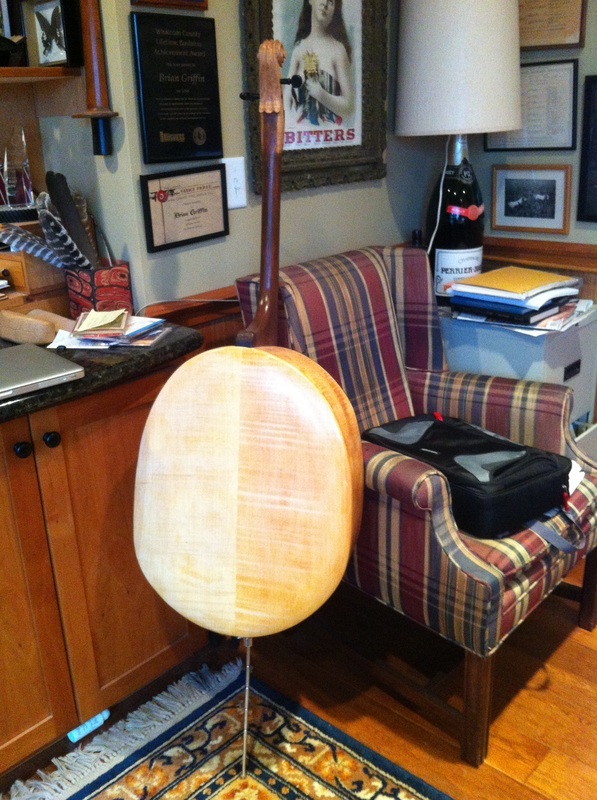 tigerstripe maple sides and a carved rounded maple back with great figure. 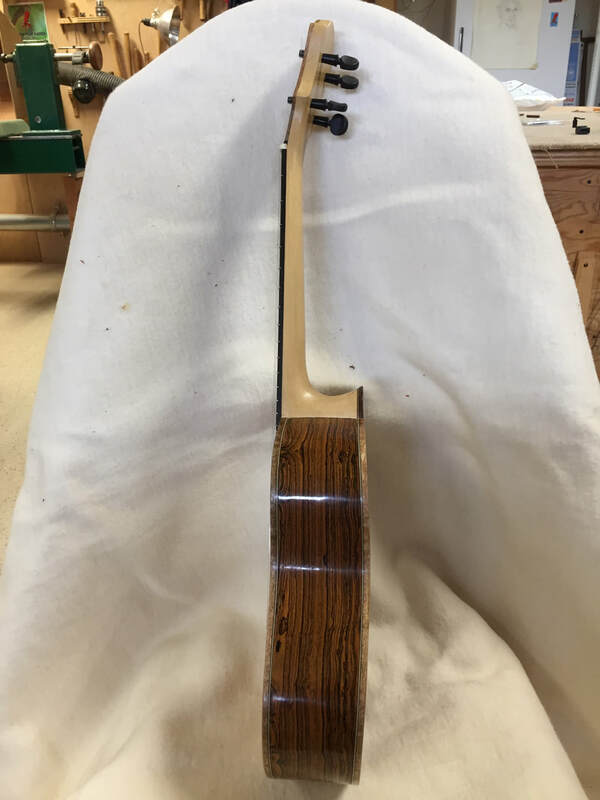 Hounduran Rosewood fretboard and bridge and heel plate. additional photos can be emailed to an interested buyer. 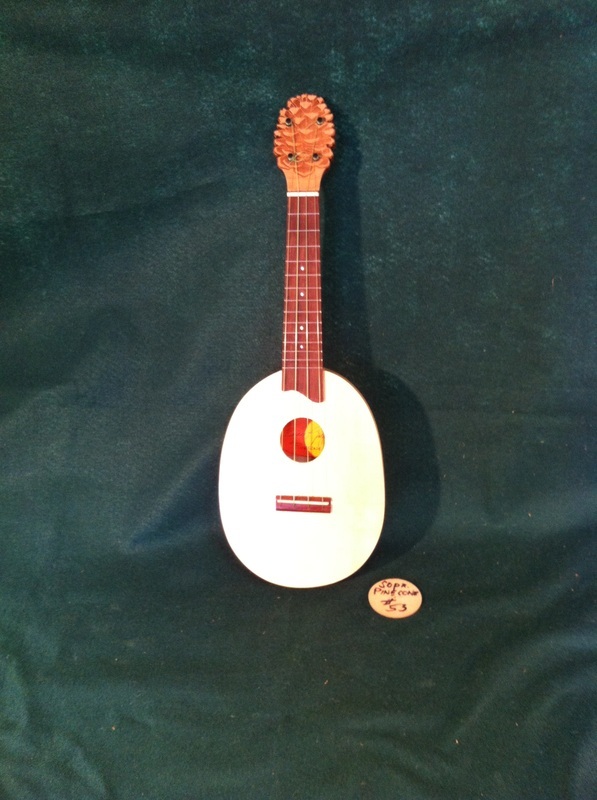 Note; You can hear the concert Pinecone being played by a wonderful Hawaian player. Search on You Tube for Uncle Mika 2012. You will be amazed. walnut necks, sitka spruce tops, fiddleback maple sides and carved out rounded backs of beautiful fiddleback maple. They all come with Peghed tuners, those planetary gears delver a 4 to 1 turning ratio, just right for ukes. the nut and saddle are buffalo (bison) bone. They are tuned re-entrant with colorful Aurora strings. the peg head plate is laser etched maple. NOT AVAILABLE. IT SOLD TODAY.